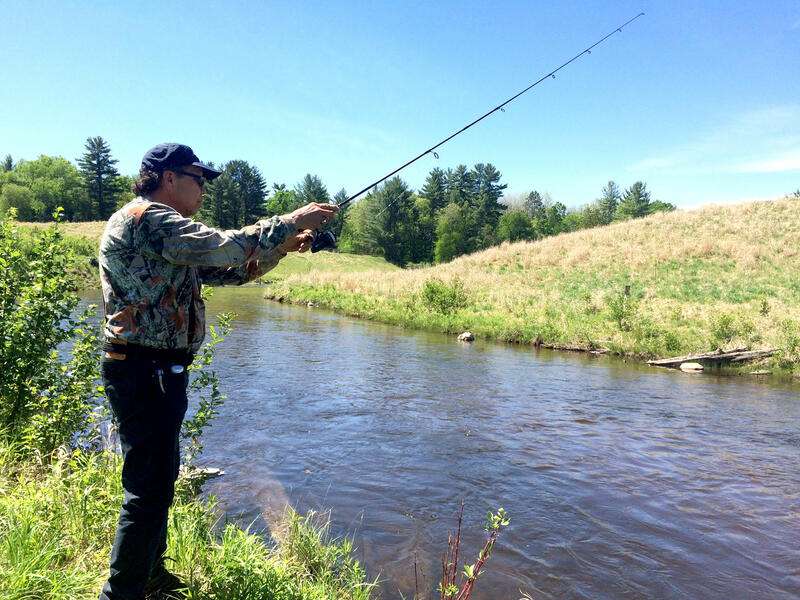 This story is part of a series on the Boardman River and its dams that originally appeared on Interlochen Public Radio and is republished here with permission. When the Brown Bridge Dam was being removed from the Boardman River in Traverse City in October 2012, Hank Bailey, a tribal elder from the Grand Traverse Band of Ottawa and Chippewa Indians, feared that people would die because of damage caused by its removal. Removal of the dam dropped the river almost instantly, causing massive flooding and extensive damage to homes by the Boardman River. “Construction guys were scrambling with their heavy equipment, trying to prevent it [Brown Bridge Dam] from going down anymore, and they were risking their lives,” Bailey, 68, said. There were multiple reasons why three dams along the river needed to be removed. They had been standing since the early 1900s and were originally constructed to power Traverse City and the surrounding community with hydroelectricity. But as time passed, the dams aged and fossil fuels replaced hydropower to accommodate the growth of Traverse City. Secondly, the dams posed environmental hazards for the river’s wildlife. The Boardman is a cold water stream, but the water gradually became warmer because of the dams. Brook trout, a fish that’s native to the river, disappeared as well. In the early 2000s, when the licenses for the dams were set to expire, the city of Traverse City and Grand Traverse County started talking about removing or repairing the dams. That’s when the Grand Traverse Band of Ottawa and Chippewa Indians stepped in. “We love our land so much here that we’ll work with anybody if we could do something to help preserve it, protect it and enhance it,” Bailey said. The tribe advocated removing all the dams on the river due to the environmental problems and because of its importance for their culture. Today, the Brown Bridge and the Boardman Dam have been removed. The Boardman was removed last year and the Sabin Dam is scheduled to start its removal process this month. The fourth dam, Union Street Dam, is now defunct and serves to maintain the water level in Boardman Lake. There are no plans to remove it. Water is an important part of Native culture and used for migration, food and traditional ceremonies, he said. “Once we dam those up, you gotta understand that, as humans, we know that when we feel bad, doctors will look at us and tell us that we have blockages in, we take those blockages out. And suddenly you feel good,” he said. “Well, could you imagine how Mother Earth feels about all of this when she’s had her arteries blocked up by these dams?” Bailey said. Once the tribe stepped in to help, it took a few more years to get support from the community, get enough money to fund dam removal and bring in the right, experienced people to aid the project. This included the Army Corps of Engineers, biologists and wildlife experts. Because the Brown Bridge Dam had been standing for so long, sediments were impounded behind the dams. That sentiment built up over the years. So when the dam came down, sediment-laden water flowed down the river, flooding homes and damaging front yards. This was, however, part of the river restoration process. But it worried Bailey since it wasn’t what he’d pictured. But today, the river looks completely different. It’s been six years since the dam was removed, but Bailey hasn’t stopped educating community children. He’s been visiting schools and speaking to raise awareness about the river restoration project. “If they see some harm being done, maybe they’ll step forward and be brave and stop somebody else from causing harm,” he said. Naina Rao reports for Interlochen Public Radio. For years Hank has been a champion for raising our awareness and sensitivities to restoration of the environment. Thanks for an article that shared the perspectives of this special person.